An 85-year-old man has died after being involved in a single vehicle road traffic collision, police have confirmed. A police spokesman said the Sussex Roads Policing Unit was called to a collision on the A24 at the Robin Hood Roundabout shortly after 10pm on Friday (September 8). The police spokesman added: “A Lexus that was being driven north on the A24 near Horsham lost control, crossed the Robin Hood roundabout and crashed into the central reservation. “Emergency services attended the scene and three casualties were taken from the vehicle. “An 85-year-old male sustained critical injuries and sadly passed away overnight at the Royal Sussex County Hospital, in Brighton. “A female, aged 70, sustained serious injuries and was treated at the new East Surrey Hospital along with the driver – a male aged 69 years who sustained minor injuries. 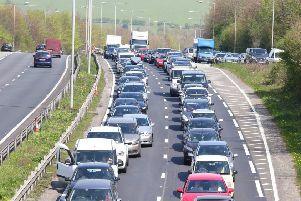 The road was closed for approximately six hours whilst officers from the Sussex Roads Policing Unit examined the scene. Police are appealing for witnesses to contact Sussex Police on 101 quoting operation Yoke or to email collision.appeals@sussex.pnn.police.uk.